HIV and health-related issues are at the core of MST managing director, Fernando Acafrao’s passion. One of his aims in establishing MST was to cause a great impact on society by bringing essential services to underserved communities. 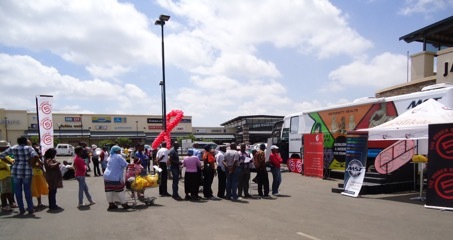 As South Africa has one of the highest HIV profiles in the world, MST is aware that much needs to be done in this field and in 2010 we organised an event with 5FM and Careways to do HIV testing and counselling at a mobile clinic set up at the Jabulani Mall in central Soweto. We were blessed with a beautiful, sun-filled day where the mobile health clinic was set up with three exam rooms and Careways had set up tents on the outside of the mobile for private counselling sessions. We were welcomed by the Soweto community and they gladly approached the mobile with eager curiosity to enquire the services being provided. We had mums, dads, gentlemen and ladies all enthusiastic to have their testing done. We believe these are one of the advantages of mobility as the vehicle is not location dependent and the community do not experience the stigma related to HIV. There is also no judgement received by nurses outsourced and this then results in an open, confidential and approachable counselling environment. There was much success related to the World Aids Day initiative as there was several grateful patients all requesting the mobile to visit again. Visit the Mobile Health Clinics website for more information. South Africa has one of the highest HIV profiles in the world.